Designed by Marvin Glass & Associates and released by Schaper in 1970, the Moon Blast Off game is set on the moon’s surface. Each of the game’s four players starts with a complement of five astronauts of a single color (red, yellow, blue, or green), and race to return their astronauts to Earth. The 12-inch diameter molded plastic gameboard is designed to mimic the geology of the moon, including four uniform craters, one for each player. A white plastic rocket locks into the center of the game board, aka the “moon launch”, with a lever. At the start of a round, each player places a single astronaut into the nearest crater. The first player spins a marble around the outside rim of the moon, roulette style. When the marble comes to rest in one of the coloured slots below, the player whose astronauts match that colour gets to “Blast Off” – launching the rocket by quickly pulling it from the launch pad. This action causes the platforms in each crater to open, plunging the astronauts into the moon’s interior. Timing is everything, as players must attempt to catch their astronauts before they fall. The player whose turn it is keeps all the astronauts that aren’t saved, including their own. The first player to collect ten astronauts is declared the winner. 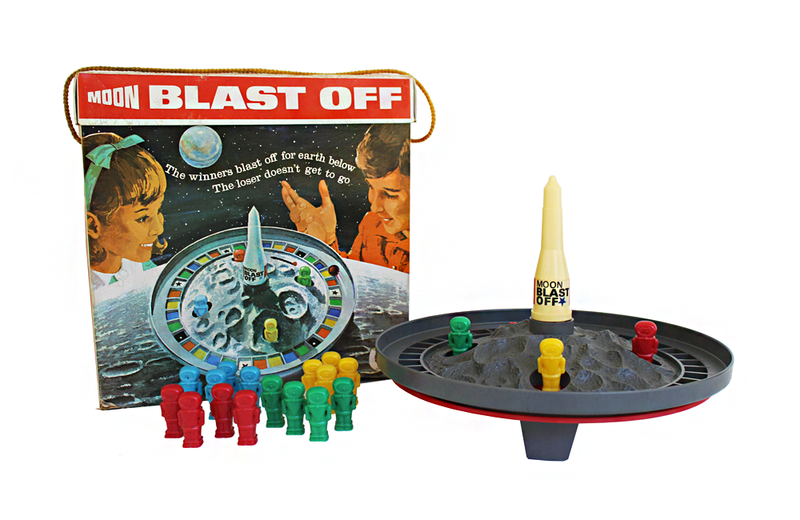 The Moon Blast Off game enjoyed a brief two-year run on store shelves before disappearing into the black hole of discontinued toys.